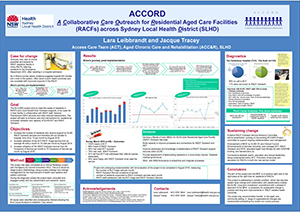 The ‘A Collaborative Care Outreach for Residential Aged Care Facilities in SLHD’ (ACCORD) project aims to deliver improvements in clinical leadership, education, processes and connections between the Access Care Team (ACT) and Residential Aged Care Facility (RACF) Outreach Service. To increase the number of SLHD residents who receive support from the RACF Outreach Service, from 45 to 73 per month by August 2018. Enhances knowledge and clarity of understanding about the RACF Outreach Service for all stakeholders. Increases referrals to and use of the RACF Outreach Service. Improves the timeliness and capacity of the RACF Outreach Service to provide care for residents in RACFs. Improves the efficiency, integration and coordination of the RACF Outreach Service. Reduces waste and unwarranted clinical variation. Improves integration of the RACF Outreach Service and NSW Ambulance. Improves the ability of RACFs to manage residents in their RACF. Improves job satisfaction for RACF Outreach Service staff, ACT staff and external stakeholders. Reduces acute inpatient length of stay for RACF residents. Improves health outcomes of RACF residents. In SLHD, there are approximately 4700 older people living in RACFs. This population often takes multiple medications and has high rates of medical illness, frailty, dependency and cognitive impairments. Interviews and surveys conducted from January to June 2017 found that many RACFs in SLHD had poor knowledge of services available, and a file audit conducted by Canterbury Hospital from March to June 2016 found there was inconsistent care planning for residents, with RACF residents lacking clear pathways for medical review. As a result, some residents were unable to access the medical and nursing care they required. Clinical telephone triage and support for RACFs has been provided by SLHD since 2008. In 2018, the ACT provides telephone triage for RACFs as well as intake for aged, chronic care and rehabilitation services in SLHD. The RACF Outreach Service began in 2013 as a pilot project, employing two clinical nurse coordinators. It was determined that improving the connections between the ACT and RACF Outreach Service would improve the health outcomes and care of residents in RACFs, by providing the right care, in the right place, at the right time. A new model of care was developed to enhance the RACF Outreach Service. Four specialist aged care nurses and two geriatricians were employed to cover all RACFs in SLHD, and the following activities undertaken. Online education courses for ACT staff were identified, covering topics such as clinical handover, telephone triage, customer service and clinical documentation. A quick reference guide for managing triage calls from RACFs was developed for ACT staff, to improve the delivery of timely care. A quarterly newsletter for general practitioners and RACF staff was established in December 2017, to communicate updates on services and projects. A flip chart clinical resource will be developed for RACF and ACT staff to use as an aid during telephone triage. Development of the resource will begin in April 2018 and contain information about clinical support, local services, clinical protocols and advice on managing RACF residents. Promotional materials including flyers and A4 wall charts will be developed for general practitioners, hospital and RACF staff, with information on local services available (expected June 2018). Clinical education sessions will be delivered to ACT staff between April and August 2018, following the recruitment of a clinical nurse educator to the team. Face-to-face education on the new model of care and relevant clinical topics will be delivered to RACFs and general practitioners in the Central and Eastern Sydney Primary Health Network (CESPHN) by June 2018. Relevant information will be shared on the SLHD intranet and website, as well as hospital, HealthPathways and CESPHN newsletters once final endorsement of the model of care is confirmed. Clinical nurse consultants from the RACF Outreach Service were rotated through the ACT, to build clinical leadership within the team. Weekly team meetings were established with the RACF Outreach Service and ACT, to improve connections between teams. A new manager was hired to oversee the RACF Outreach Service, ACT and Hospital in the Home programs in SLHD, to provide shared governance across all teams. Geriatricians were included in the RACF Outreach Service, to provide clinical governance. The capacity of medical and nursing staff in the RACF Outreach Service was enhanced, with treatments provided by Hospital in the Home where possible. A telehealth pilot began in March 2018 between RACF Outreach Service clinicians and geriatricians initially, with a view to extend this to RACF staff and general practitioners in the future. Streamlining of electronic medical record documentation, scheduling and billing is underway. The Ambulance Arrivals Board is monitored by ACT staff and RACF Outreach Service in collaboration with NSW Ambulance. A Memorandum of Understanding with NSW Ambulance is underway, to ensure paramedics identify residents who can be supported by the RACF Outreach Service. Interviews and surveys conducted between January and June 2017 showed that RACF staff had poor knowledge of SLHD services, with 20 per cent unaware of the ACT and 40 per cent unaware of the RACF Outreach Service. Following implementation of some solutions, a survey conducted by CESPHN between July and August 2017 found that 90 per cent of RACF participants were aware of the RACF Outreach Service, with five requesting additional information. The number of ACT triage calls increased from an average of 46 calls per month 2016 to 108 calls per month in 2017. RACF Outreach Service occasions of service increased from 46 per month in 2016 to 117 a month in 2017. The number of residents per month supported by the RACF Outreach Service increased from an average of 45 per month in 2016 to 51 per month in March 2017. RACF staff satisfaction with the ACT triage and RACF Outreach Service. Persistence and hard work will pay off. Ensure you have enough members in your project team with dedicated time for the project. Think long term with the stakeholders you would like involved. The political and economic climate is important to consider when developing solutions. Think about what can realistically be achieved in the current climate. Other projects or initiatives occurring in your area, local health district and organisation can influence your ability to implement the project and gain new resources, either positively or negatively. Boyd M, Bowman C, Broad JB et al. International comparison of long-term care resident dependency across four countries (1998-2009): a descriptive study. Australasian Journal on Ageing 2012;31(4):233-40. Burkett E, Martin-Khan MG, Scott J et al. Trends and predicted trends in presentations of older people to Australian emergency departments: effects of demand growth, population aging and climate change. Australian Health Review 2017;41(3):246-53. Hullick C, Conway J, Higgins I et al. Emergency department transfers and hospital admissions from residential aged care facilities: a controlled pre-post design study. BMC Geriatrics 2016;16:102. Tunhavasana J, Edgley J, Banister-Jones C. PAC4RAC: Providing Appropriate Care for Residents in Aged Care. Chatswood NSW: ACI; 2016. Emergency Care Institute New South Wales. Aged Care Emergency Model of Care. Chatswood NSW: ACI; 2013. NSW Agency for Clinical Innovation. ACI Clinical Innovation Program: Specialised geriatric outreach to residential aged care. Chatswood NSW: ACI; 2014.